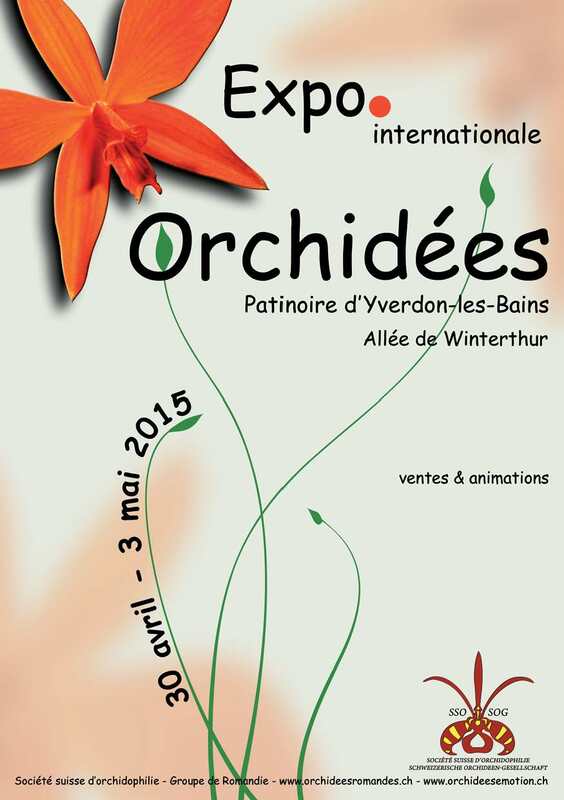 Ci-dessous, les expositions passées d’orchidées en Suisse et à l’étranger. La participation du Groupe de Romandie est mentionnée le cas échéant. Orchidées un jour, passion pour toujours ! Tuesday 7th April and early Wednesday 8th April 2015: Staging. Wednesday 8th April: Ribbon Judging. Wednesday 8th April, evening: Preview and official opening. Wednesday 8th – Thursday 9th April: Science conference at the Jodrell Laboratory Lecture Theatre, RBG Kew. Friday 10th April: Hardy orchid conference at RHS Vincent Square near Westminster in Central London. 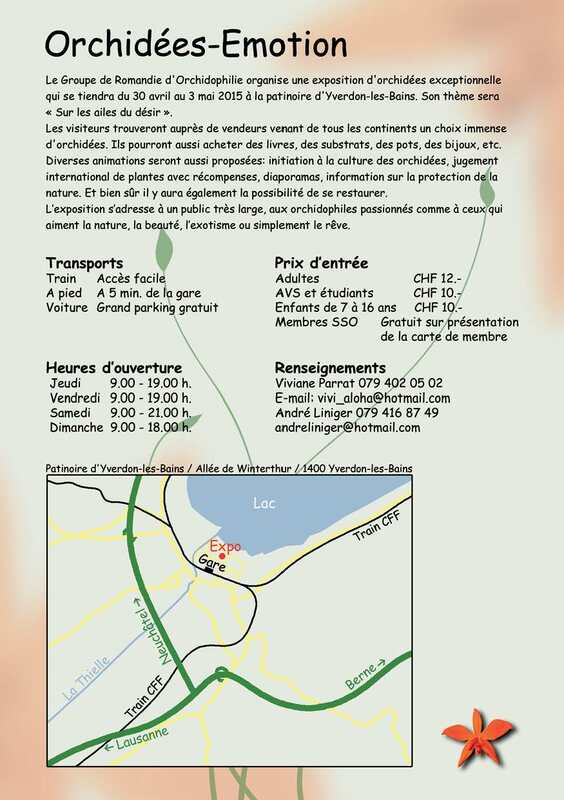 Friday 10th – Saturday 11th April: Horticulture and travel, two parallel conference sessions at RHS Vincent Square, London. Saturday 11th April: Grand Gala Dinner at Royal College of Physicians. Thursday 9th – Sunday 12th April: Show open to the public. International Speakers so far include (subject to change & confirmation), Alec Pridgeon (US), Ken Cameron (US), Claire Micheneaux (Australia), Kingsley Dixon (Australia), Stephan Gale (Hong Kong), Henrik Pedersen (Denmark), Hannah Rasmusssen, Samuel Sprunger (Switzerland), Svante Malmgren (Sweden), Hildegard Crous (S Africa), Camiel de Jong (Netherlands), Holger Pemer (China), Tom Mirenda (US), Lourens Grobler (S Africa), Martin Motes (US), Jean-Michel Hervouet (France), John Elliot (Singapore), Andre Schuiteman (UK), Cassio van Den Berg (Brazil), David Roberts (UK), Christopher Bailes (UK), Chris Purver (UK) etc. The lectures are receiving support from the RHS Coke Trust Bursary Fund and the Linnean Society of London. The Show will be in both RHS Halls (http://www.rhs.org.uk/Shows-Events/RHS-London-Flower-Shows/Getting-to-the-shows ) and there is much interest to exhibit from Europe and around the world already. A list of potential exhibitors is being put together. If you are interested in exhibiting at the show please initially contact Clare Hermans (Clare.Jepson@btinternet.com). Official invitations will be sent out by the RHS later this year. There will also be displays of Botanical Art and tours of the RHS Lindley Library. Registration will be split into three distinct packages: A ‘Science’ Package’ (at £70.00), a ‘Horticultural Package’ (at £70.00) and a ‘Show Package’ (at £50.00): all packages will give full access to the Show, the Preview, early entry to the Show, delegate lounge with refreshments, judging if qualified, opportunity to book visits, tours & Gala Dinner and either access to the Science lectures at RBG Kew, the horticultural lectures at Vincent Square or just the show. For the very keen ones there will be a ‘Full Package’ (at £130.00) giving access to all lectures. Day tickets for the Show and partner registration (at £35.00) will be available. Please book early as lecture space will be limited. These early-bird rates will increase substantially on 1st December. There will be an opening ceremony and reception at the RHS Halls on Wednesday 8th April. The Gala Dinner at the Royal College of Physicians in Regents Park is organised by the Orchid Society of Great Britain and will be a grand event with pre-dinner drinks, 4 courses and beverages for £70.00. There also will be an optional botanical tour of the College Garden. Day trips (10-11th) to RHS Garden Wisley and RBG Kew are planned, including a behind-the scenes tour. Historical tours of London and the Chelsea Physic Garden are also planned. The website is now partly available and on-line Registration will go live later this month. 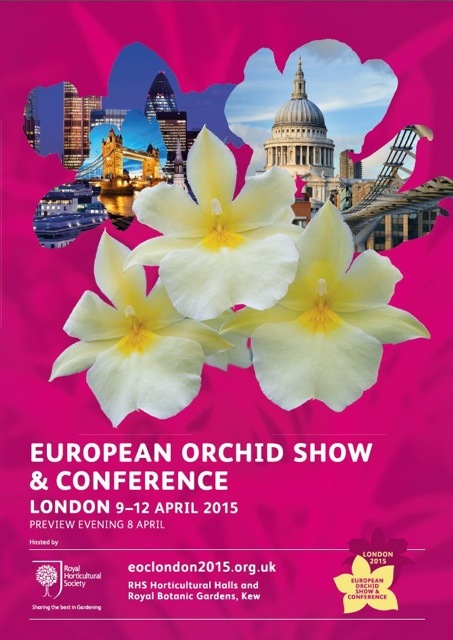 As official journal of the European Orchid Council, The Orchid Review will be producing a bumper 100-page issue in September 2015. This will provide an informative round-up of the 2015 EOC Show & Conference. 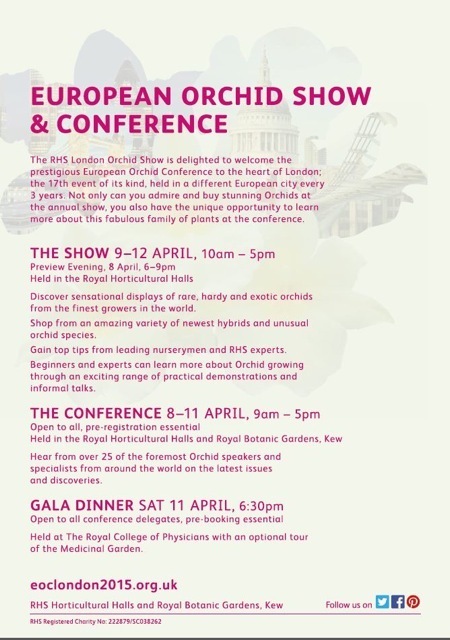 Articles will include: total show coverage, including social events; selected keynote lectures in full; show awards to plants, stands and people; summaries of papers presented; inspiring educational initiatives; RHS Orchid Committee awards from EOC; regular content e.g. News, and much more. It will be posted to all Orchid Review subscribers worldwide (current and new subscribers at the EOC). There will be a reduced subscription offer to Show visitors, and an extra special offer to EOC registrants. 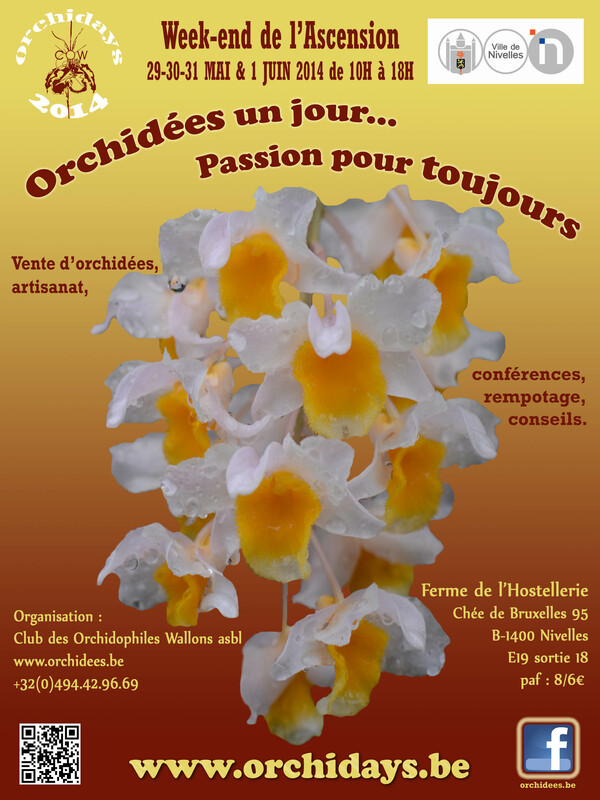 The British Orchid Council has kindly agreed to produce a Registrant Handbook for the Conference and any queries regarding advertising in this can be sent to Chris Barker cjbandjb@ntlworld.com. Meanwhile students at Writhlington School are developing exciting events for the show and looking at the design and production of the delegate bags.